Sony has launched a lot of devices in 2017 like the Xperia XZs, XZ premium, XA1, XA1 Ultra, XZ1, XZ1 Compact, XA1 Plus, etc. Still, there are some more to come, and since Android Oreo is already out, we can surely expect to see some new Xperia phones running Android O right out of the box. 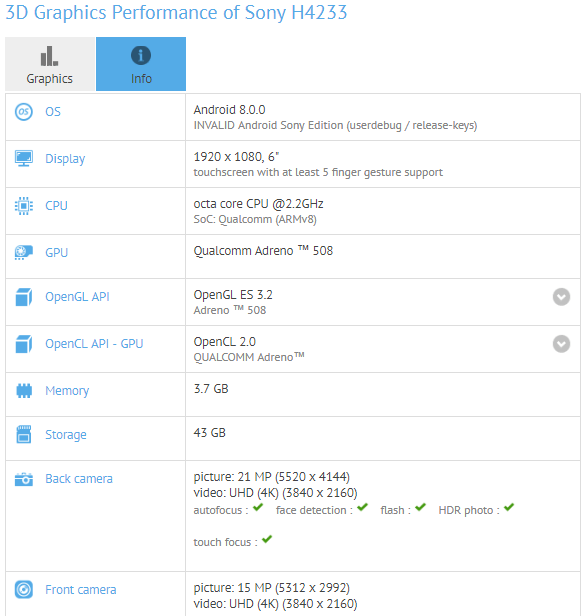 Today, an unknown device named Sony H4233 passed through the benchmarking website GFXBench which suggests that a Mid-range smartphone with a big display and Android Oreo launching soon. Specifications wise, the Sony H4233 is rocking an octa-core 2.2GHz Snapdragon 630 Chip with Adreno 508 GPU. There is 4GB of RAM and 64GB internal storage. The phone features a 6-inch Full-HD Display with a resolution of 1920x1080p which means that there is no bezel-less or 18:9 thing going on here. On the rear, there is a 21MP single camera with the ability to capture 4K video. There is also a 15MP (or maybe 16) front-facing camera which too, can capture 4K video. Lastly, Android Oreo is running out of the box. So, seems like a mid-range smartphone from Sony with a big display and Android Oreo is coming soon. What are your views on these specifications? What price should Sony keep for a phone with such specifications? Do let us know via the comments section.